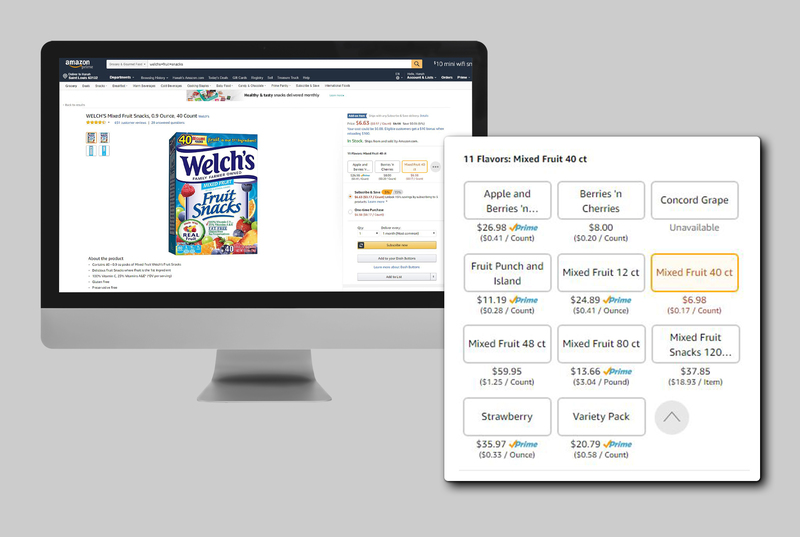 When a product has multiple sizes, colors, flavors, scents and pack sizes, the last thing a customer wants to do is browse through dozens of product pages to find the right option for them. Instead, brands will list an item on Amazon in variations, having all variants on one product page. 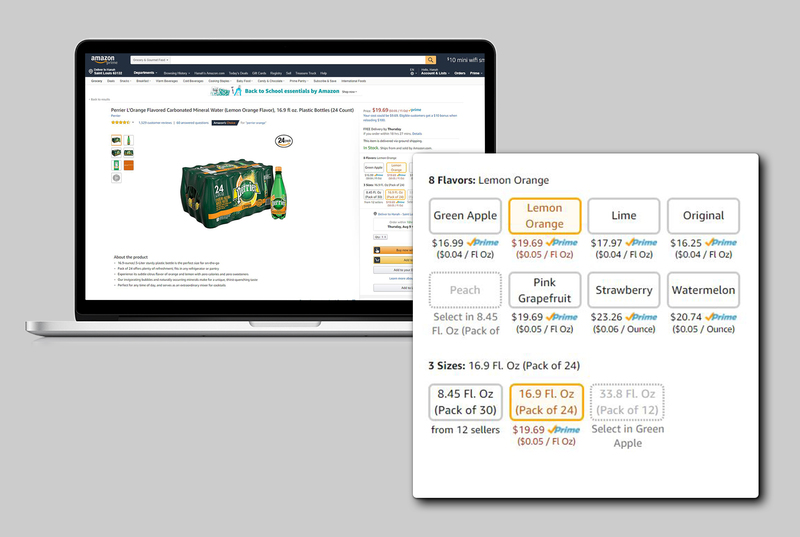 The customer can then see all options on a single product listing and can easily select, for example, the flavor and size that is right for them. They don’t have to scroll through the search results pages and hunt for the option they want, creating a better online shopping experience. Aside from improving the customer experience, many brands will create variations to increase conversions and boost sales. A product will typically have high-performing and low-performing variants. For example, the Chicken & Rice flavor may perform better than the Lamb & Rice flavor, or the 31.1-pound bag may sell better than the 8-pound bag. This could be due to customer preference, but it may also be due to certain variants appearing too far down in the search results, making it difficult for customers to find them. 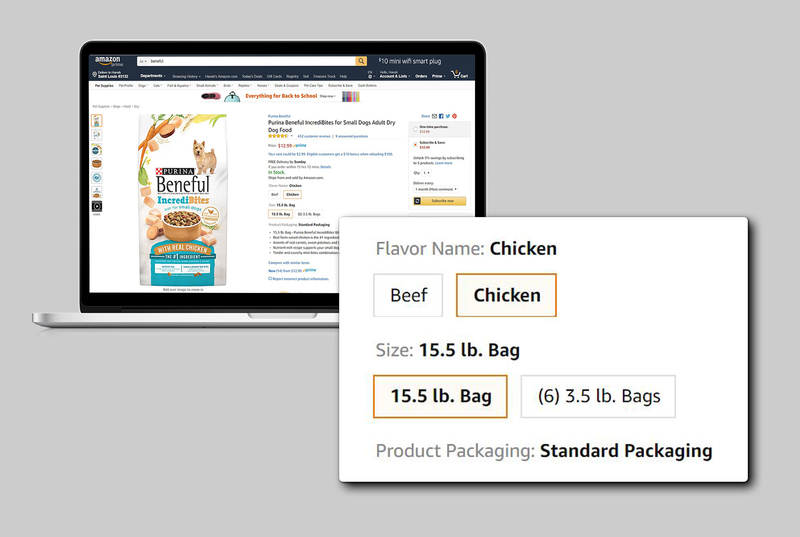 With lower-ranking items appearing on the same product page as items that rank high, the less popular variants get to ‘piggyback’ off the success of the higher-performing products and receive greater visibility. Some lower-performing variants might then become better sellers once it’s easier for customers to find them. Another reason brands create variations is to increase the number and quality of product reviews and customer questions. If one variant has a high number of positive reviews and the other none, merging the variants together will put all reviews and questions on one product page. 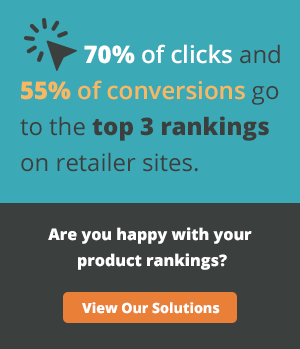 This can help improve conversions on the lower-performing SKUs. "With lower-ranking items appearing on the same product page as items that rank high, the less popular variants get to ‘piggyback’ off the success of the higher-performing products and receive greater visibility." Variations on Amazon are referred to as parent-child relationships. The parent is the main product (for example, fabric softener) and the children are the variants, such as the different scents (lemon and lavender) or different pack sizes (1 pack and 3 pack). An item can have multiple variants, such as a bottle of water that comes in different flavors and different sizes, e.g. strawberry 500ml bottle and mango 1 liter bottle. The customer can select the flavor and size they want on the same product page. While many brands are keen to create variations for the reasons mentioned earlier, they must adhere to Amazon’s guidelines when setting up variations. If they don’t, sellers may find their selling privileges revoked and, in some cases, have reviews taken away from certain listings or variations broken. On the vendor side, all catalog edits must be reviewed and approved by the catalog team, so variation creation requests that go against Amazon’s guidelines will be rejected. 1. Customer experience: When creating variations, the number one priority is the customer experience. Think about whether a variant enhances the customer experience or leaves room for possible confusion. The last thing you want to do is confuse the customer, as this will result in a negative customer experience and possible negative product reviews and feedback — not to mention any impact it may have on your brand’s reputation. For example, if you are selling cat food and one size comes with a free container, you may mention this in the bullet points. But what if the customer selects the size variant with the free container, reads the bullet points, sees the container is included, and then decides to select a smaller size but doesn’t re-read the bullet points? They may still be expecting a free container. While the information is accurate on the listing, you cannot assume the customer will re-read the product information for every variant they choose. If the customer then receives the smaller size without the free container, they might then leave a negative review and return the item. 2. Variation themes: When creating a variation, there are different themes you can select from. These themes vary by product category and type. The most common are size, color, scent, flavor, weight and pack size. A product should naturally fall into one of the variation themes for that category. If it doesn’t, you should question whether the product should really be a variation. 3. Respect Amazon’s policies: As you know, Amazon has strict policies and guidelines when it comes to variations. Fail to meet these and you put your listings and account at risk. Don’t put your products at risk for the sake of an extra buck. Yes, other sellers may be doing this, but doesn’t mean you should follow. If you want to remain long term, play by the rules. 4. Different categories have different rules: The formatting of variations differs across product categories. In some categories where a variation exists, the product content will be visible at the parent level. This includes titles, bullet points, product descriptions and images. Even Enhanced Brand Content pages must be created at the parent level. This means the product page content will not change when the customer selects a different variant. In other categories, the content is visible on the product page at child level, meaning it changes when a variant is selected. This is a far cleaner experience for customers. If the content is visible only at the parent level, there is more chance of creating confusion if the product features vary across child SKUs. 5. Test the user experience: If you are unsure, test the user experience first and ensure the variation does not cause any confusion. Check out the competition and see how they use variations. How have they created them, what themes do they use? Is the customer experience enhanced, or is there room for confusion? Below is an example of a variation that could cause customer confusion. The item comes in different pack sizes and different flavors. The variation only shows the different flavors and mixes the pack sizes together. A customer might end up thinking they’ll get a 66 pack and get a 40 pack instead. The brand should have split the variation themes into two, like in the example below. The flavors and pack sizes are clear; there is no room for error. While product variations can help boost conversions, a negative customer experience can damage product sales. Amazon has guidelines and policies in place for a reason, and brands should always follow them if they want to to ensure success. Carina McLeod is an Amazon Retail Specialist with over 12 years’ experience working with Amazon. She spent over 7 years working as a Vendor Manager at Amazon UK, working across multiple product categories including Home & Garden, Personal Care, Sports & Fitness and Clothing. Her specialty was launching new categories into the UK market. In 2013, Carina set up her own consultancy business, eCommerce Nurse, helping manage and support both Sellers and Vendors in growing their businesses on Amazon. In 2018, she launched Vendor Society, a membership website that provides Amazon Vendors affordable learning resources and support to help them maximize their sales potential on Amazon. Through her years of experience, she can happily say she speaks ‘Amazon’ proficiently, knows their requirements and systems, and most importantly knows what it takes to become a successful Vendor and Seller on Amazon in both North America and Europe.